← First Christmas Party of the Season! Can you finish that quote from a famous sailor boy?? We’ll get to that a little later! Since I’ll be missing my usual Weight Watchers meeting on Saturday, Alice and I decided to go Thursday morning so that we could hear all about the new Points Plus+ for 2012. We made sure to go to a meeting led by our leader Mary Lou. I always feel better if I have to go to another meeting, if it’s one of hers. She is the best! But I’ve told you that before! There are some changes. Instead of 29 points each day, I get 26 points with the flexibility of using 29 if necessary. I’m going to try to stick to the 26 just because I like the challenge. We’ll see how I do. It might sound silly, but I wanted to know what the new program was before going away for the weekend. I want to try to be as on track as possible for the weekend. We’ll see how that works! 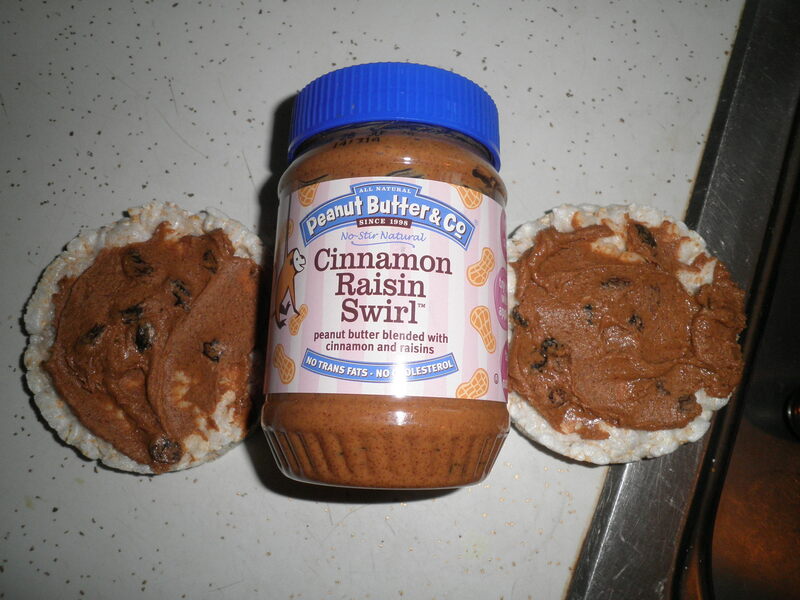 Rice cakes with Peanut Butter and Co. cinnamon raisin swirl. Yum! And very filling! Now to get back to my original question…I’m strong to the finish, ’cause I eat my…SPINACH!! I had bought a lot of vegetable at the end of last week. Now I’m working hard to use them before leaving on our trip. We’ll only be gone a few days, but the veggies are sure to be all funky when I get back if I don’t use them now. One of the things I had bought was a big bag of spinach. It’s not the baby spinach so I have to chop it up but it’s so much less expensive, I don’t care! My first combo was on Monday night. 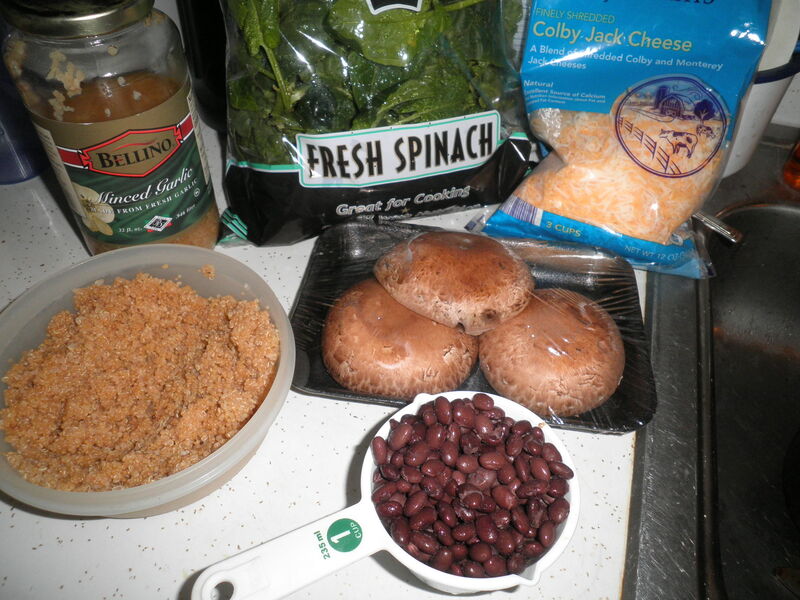 Started out with garlic, Portobello mushrooms, black beans, quinoa and shredded cheese. 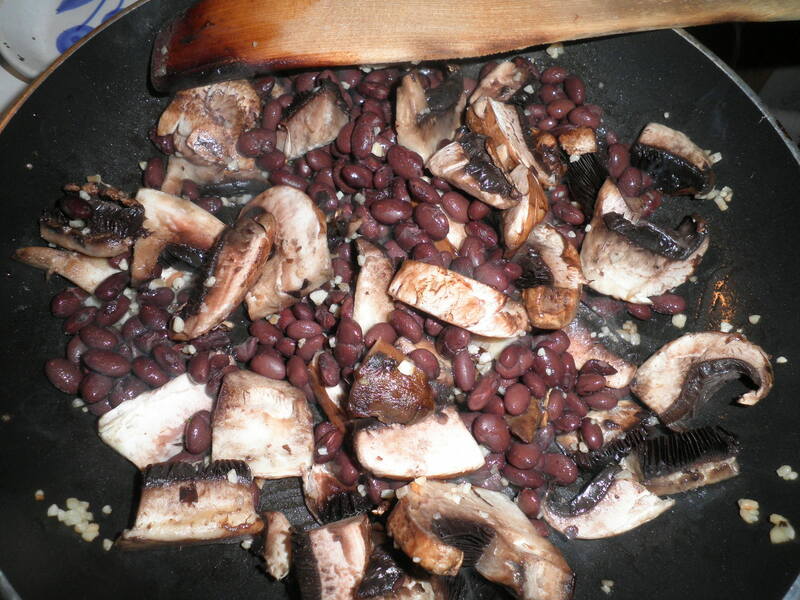 Sautéed up the mushrooms, garlic and black beans. 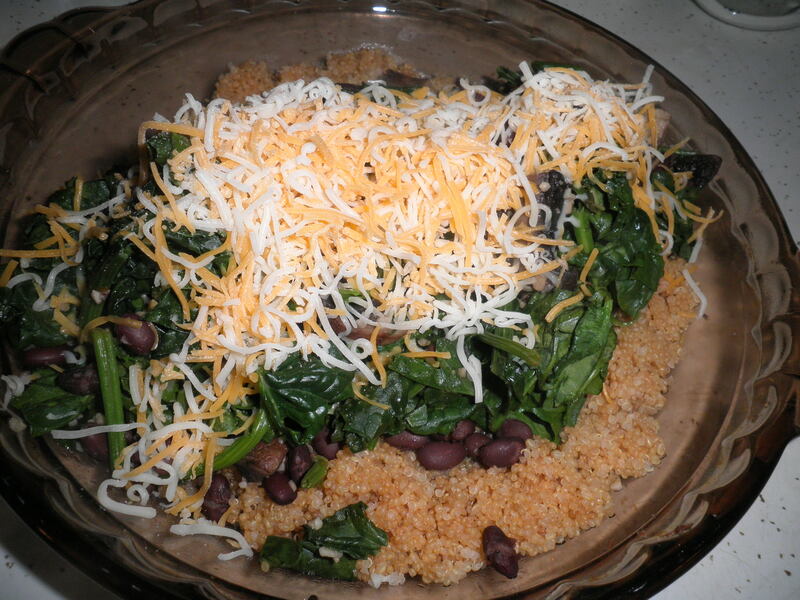 I then added the spinach and put it all over the quinoa. Topped it all with some shredded cheese and then with some sriracha sauce, but that was after I took the photo. 😦 This was really delicious and one that I’ll try to recreate again. Thursday night, I figured I’d finish up the spinach. 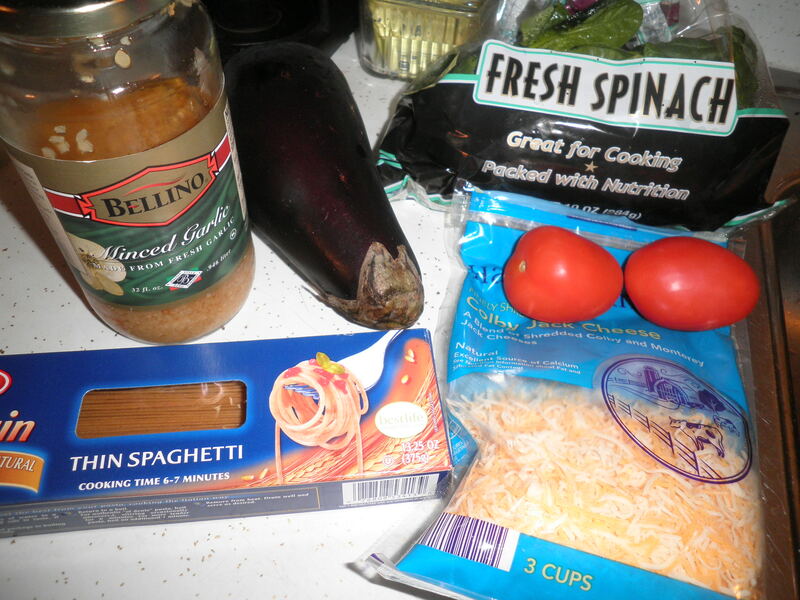 Fairly similar combo…garlic, spinach, tomatoes, eggplant, whole wheat pasta. 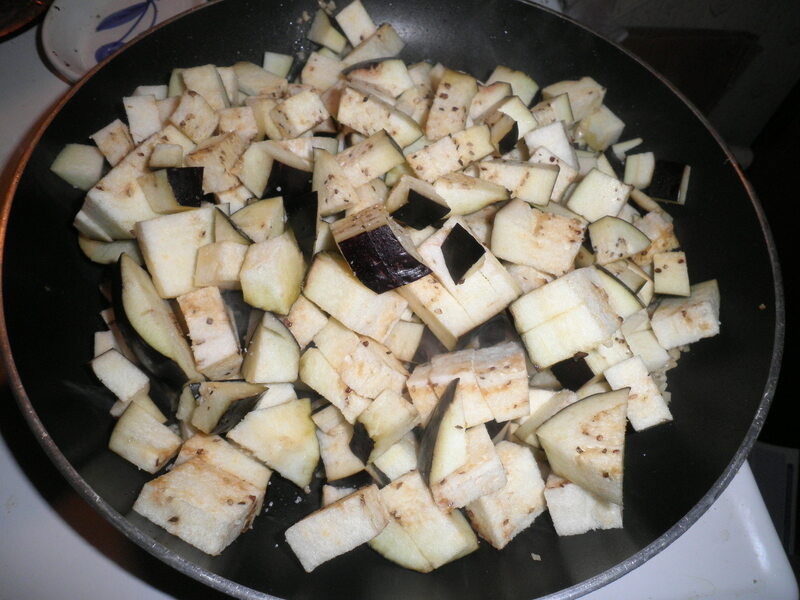 Sautéed up the garlic in olive oil with all of the eggplant. I also added some veggie broth to keep it moist and make a bit of a sauce. Topped again with sriracha sauce. When I bought that big bottle of sriracha, I thought it would take me forever to go through it, since I’m the only one using it. I’ve gone through half of it!! I was surprised, but I really do like it. This was really delicious and extremely filling. 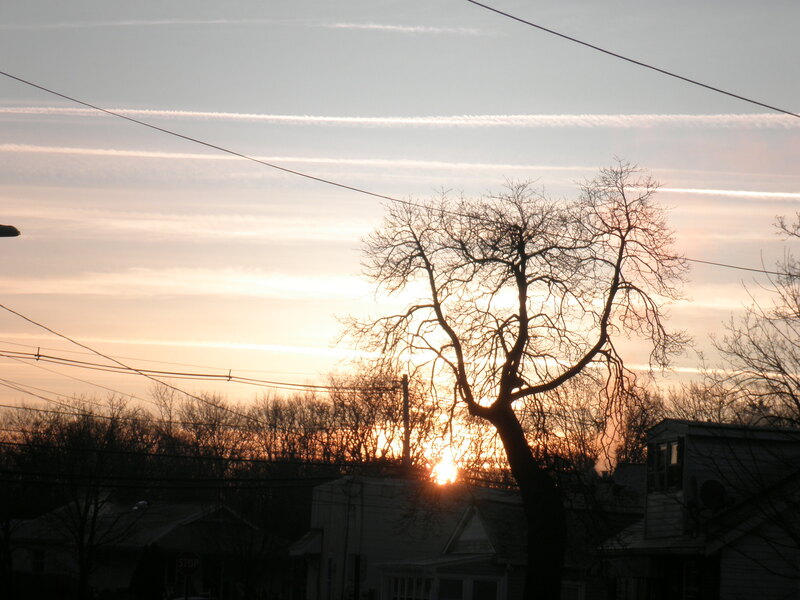 So it’s Friday and I couldn’t leave you without a sunrise picture. 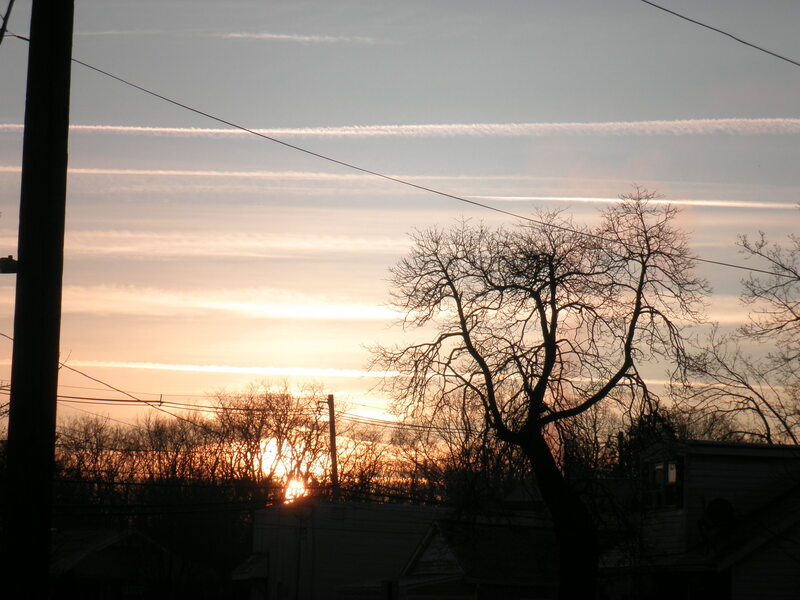 I’m headed out of town Saturday morning. I’m not sure how successful I’l be at posting while I’m on this trip, but I’ll keep you updated on Twitter, just follow me @bcdcfran. Love that you work the system and use your sisters bank. We are so alike, anything to save a buck. 6%? Completely unnecessary. asked Ele if she would mind doing it and of course she was willing to. I would have had to pay almost $8!! It’s crazy. Yes, we are a lot alike…that’s a good thing! Oh Fran, the spinach dish looks delicous. And the sunris shots??? Gorgeous! Have a wonderful weekend. Thanks, Roz! You have a great weekend, too! Glad you like my photos, I love them too! Hi Allie! 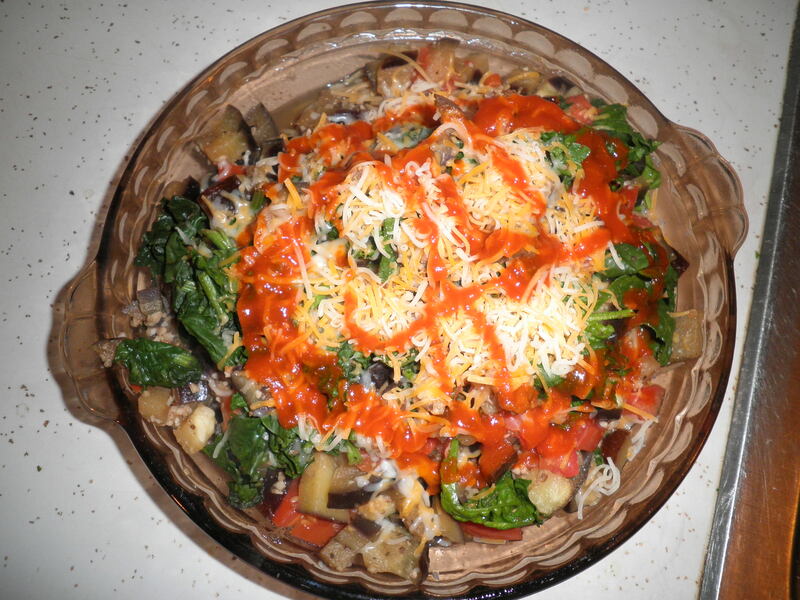 Just love my veggies and now that I’ve found sriracha…they’re even better! Thanks, Marie! Glad you like the recipe and my pictures. I think we’ll have fun, we’re looking forward to it! i love finding ways to use up veggies! Have a great trip. 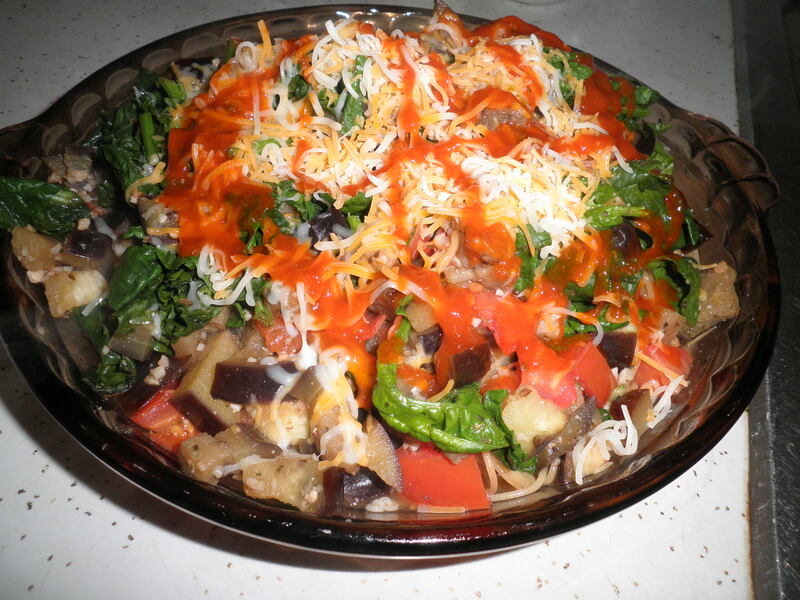 That looks like some yummy nutritious combos you came up with to use up the veggies. Nothing like motivation! Hi Shell!! Thanks. We should have a good time. I love my veggies!